For the last few years during our son’s spring break, we’ve taken big trips. Our favorites have been the last two years: an epic hiking adventure through Sedona and the Grand Canyon; and a countrywide trip through Belize, from the barrier reefs, across the tropical rainforest of the Maya Mountains, and then on to the ancient Mayan ruins of Xunantunich along the border of Guatemala. This year we’d planned an adventure to Valencia, Spain. Then Mother Nature got involved, and decided to whip central North Carolina through a winter blend of snow, sleet and ice … repeatedly. Over two weeks of school days were frozen, literally. The governor forgave three days, tacked another three on to the end of the year, filled in two teacher workdays, and deleted one day of Spring Break. But by taking away the Friday of spring break, we are relegated to traveling on Saturday … which means we lose another full day of travel getting to a destination, then another full day home. So, our travel distance has been substantially shortened. We thought, ‘we’ll just go to the Caribbean.’ But we can’t get there from here–at least, not directly. Two or three hops, plus an overnight stay and an eight or nine hour total of time in the air. Then we thought, we’ll just go out west to hike, maybe New Mexico this time. Ten hours. San Diego or Oregon? Eleven hours. Sigh. 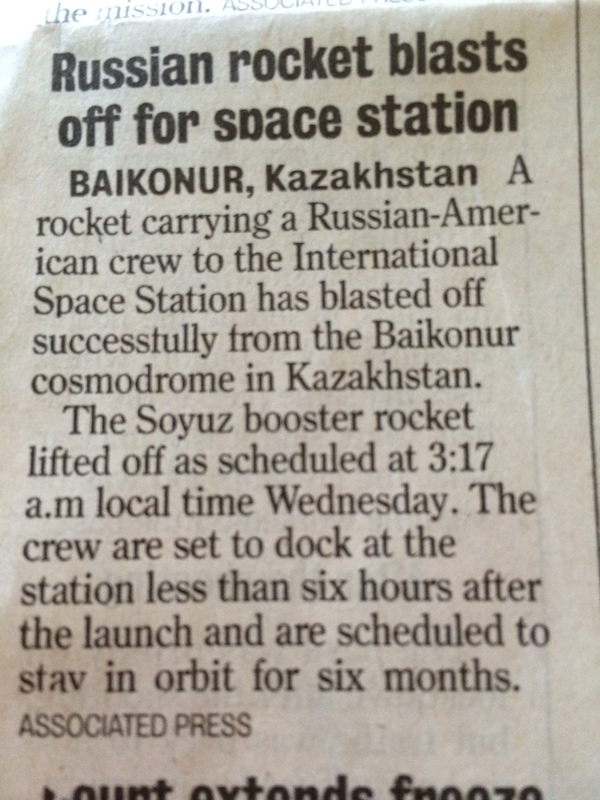 But the Russian rocket can get from the Earth to the International Space Station in “less than six hours.” I’m pretty sure that’s much farther than from North Carolina to Dominica. How can I get my own rocket?